With the number of reported cyber security breaches increasing year-on-year, information security is one of the hottest topics in business today. While the scope of data stolen from these incidents is wide, it comes as no surprise that organisations are applying particular focus to protecting the information that makes up the very fabric of their business – their Intellectual Property (IP). In its 2016 survey on the Global State of Information Security, PwC reported a 38% increase in detected information security incidents, prompting Dennis Chesley, Global Risk Consulting Leader for PwC, to express how “many executives are declaring cyber as a risk that will define our generation”. The report reveals a 56% increase in the theft of IP specifically and goes on to show that, while all industries are impacted by IP theft to an extent, organisations in the public sector, financial services and power and utility industries are particularly targeted – with increases of 159%, 183% and 234% respectively in 2015. As well as affecting the businesses which fall victim to them, these attacks also have a noticeable impact on the global economy. In its updated 2017 report, the IP Commission estimates that the annual cost of counterfeit goods, pirated software and the theft of trade secrets costs the US economy in excess of $225 billion per year – and that figure could indeed be as high as $600 billion. The report also finds no evidence to cast doubt on a 2015 estimate provided by the Office of the Director of National Intelligence that economic espionage through hacking costs $400 billion per year. The US isn’t alone when it comes to feeling the effects of IP theft; the UK’s Intellectual Property Office states that IP crime is costing the UK economy hundreds of millions of pounds each year and we would expect to see a similar trend worldwide. With such shocking figures in mind, it’s imperative that organisations look to protect their IP. The future of IP security undoubtedly lies in the implementation of new technologies, especially those equipped to encrypt data against the more sophisticated hacking techniques that quantum computers will bring. Quantum cryptography is one such technology; implementing quantum-safe security solutions will allow organisations to encrypt their data to a level unparalleled by more traditional cryptographic methods. This will not only protect their data from real-time hacking, but also from a ‘download now, decrypt later’ approach where criminals store stolen encrypted information to decipher in the future – most often when the appropriate technology becomes available. While the technology designed to stop IP theft exists, there is a shortfall of businesses that are properly analysing their defences and readying themselves for future attacks. 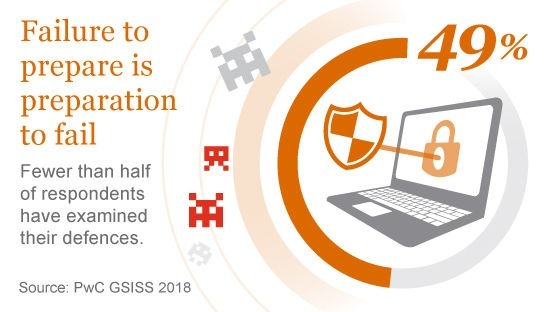 In its 2018 Global State of Information Security Survey, PwC researchers have switched their attention to the prevention of cyber attacks, citing that less than half (49%) of respondents have examined their defences in the first place. Such an oversight may be worrying to discover, but will only exist for the short-term. Soon enough, all organisations will have no choice but to acknowledge the threat posed by new and innovative hacking techniques and move to secure their Intellectual Property, or risk it being stolen. What will still surprise some individuals is the timeframe in which this will happen: It’s not in the distant future, it’s on the horizon. To find out more about how our quantum-safe security solutions can help protect your IP, please contact us.